The Dirty Dozen – Are You Going To Be One of Royles Inner Circle Hypnotists?? THAT MEANS YOU GET EVERYTHING MENTIONED IN THIS VIDEO..
*A Grand Total of 180 Physical DVD Disks Sent To Your Front Door. *And the other 63 are DATA-DVDs that work on All Computers. *A Huge Collection of Physical Stuff Weighing in at Around Seven (07) Kilograms. The Stuff You Will Get Legal Resale Rights On. *These 35 products With Legal Duplication and Resale Rights. 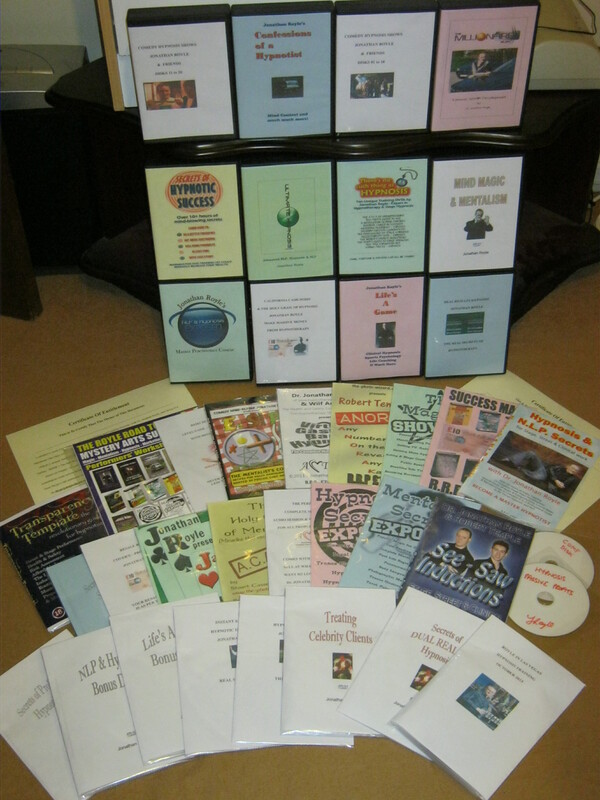 Not only will these prove to be invaluable training materials for you to study yourself, but also you’ll be able to make massive profits selling them to your own customers, which you are taught how to do in the “Passive Hypnosis Profits” Package which was mentioned in the videos earlier and to which you will gain access when you become one of the Lucky 12. Check out details of all 35 of these Amazing Hypnosis & Mentalism Training Products, which with Resale Rights would usually cost you $2997 on their own, but today can be yours inclusive as part of this bumper package for just $997. everything mentioned at http://www.hypnotorious.com/hypnotherapytrainingcourses.htm these usually retail for £297 Sterling (Approx $487) purchased on their own! cost you £67.00 Sterling (Approx $109). “The Millionaire Plan” as per: http://www.millionaireplan.net/ Usual Retail of £97 Sterling which is (approx $158). that Royle Ran in Vegas in October 2013 as per the course details at: https://klearthoughtsmentalismhypnosis.wordpress.com/2013/04/12/the-ultimate-hypnosis-course-stage-hypnotism-nlp-hypnotherapy-complete-mind-therapy-live-in-las-vegas-with-dr-jonathan-royle-jay-noblezada-3-days-that-will-change-your-life/ when these do go on general sale they will retail for around £297 Sterling (approx $487) a Set. IF YOU’VE NOT ALREADY MADE THE INTELLIGENT DECISION TO INVEST INTO YOUR FUTURE SUCCESS AS A HYPNOTIST AND TO GRAB THIS ONCE IN A LIFETIME OPPORTUNITY, THEN TAKE A LOOK AT WHAT SOME OF MY PAST STUDENTS & COLLEAGUES HAVE TO SAY ABOUT THE STUFF THAT YOU’LL BE GETTING AS PART OF THIS MONSTER PACKAGE. Next here are Testimonials from people who attended my “Ultimate Change Seminar” in London and the “Real Results Hypnosis” event in Bristol. Ultimate Hypnosis Training Has to say after the event. Entertainment Cruise and this video says it all really. out these few internet links that follow..
MORE TESTIMONIALS ON FILE FROM PAST STUDENTS JUST LIKE THESE. Thanks Jonathan, I’m really glad we met, in terms of learning stage hypnosis. And so are the 700 US Devil Pups and 750 real, genuine US Marine recruits at Camp Pendleton. The US Government does not let civilians talk to or interact with Marines recruits in boot camp, and because of what you taught me, they broke that rule. That is very rare, and a very high honor. I guarantee you will never have another stage hypnosis student who will be able to say they did group hypnosis on Junior Marines, or did suggestibility testing on US Marine recruits. the hypnotist’s hypnotist. Thanks, very much, Jonathan! you’ll probably have little need for very much else. 4) The Deadline for this Special Offer is Mid-Night (Est) on Monday 14th April which is equivalent to 5am UK GMT (Tuesday 15th) or When all 12 Packages have been claimed. 5) If your order is placed BY USING THE BUY IT NOW BUTTON LOCATED HERE and all 12 packages and places have gone, then your money will be instantly refunded. 6) You Agree Never to Sell, Trade or Give Away the information, Secrets, Techniques and Strategies within these training products and agree by purchasing to retain these items for your own personal study and use only. 07) It is also agreed by purchasing that the only items you will ever sell on to anyone else, are copies of the items upon which you will gain legal duplication and resale rights. THIS BONKERS OFFER WILL NEVER BE REPEATED – SO YOU MUST ACT RAPIDLY TO AVOID MISSING OUT.. This entry was posted in Uncategorized and tagged hypnotherapy training course jonathan royle, jonathan royle hypnosis training, stage hypnosis training jonathan royle by klearthoughtsmentalismhypnosis. Bookmark the permalink.